I've returned to bucolic Frederick, ready to seize the day and take the town by storm. Or instead, I'm totally and completely jet-lagged and have had my 3rd night in a row of waking up at 3am. Amateur. A world traveler I am not, though I guess, technically, I am, having spent time in Rome, Abruzzo, and ever so briefly in Copenhagen. I'm new to the 8 hour flights and the accompanying layovers. To the strangeness of being functionally illiterate with words swirling about that I simply do not understand. (Example: Uscita is not a subway stop in Rome. It means exit. Moron.) To driving up what seem to be endless and death-defying mountains with twists and curves that no bus should ever try to maneuver. But with that said, I really enjoyed the adventure. I liked being away from home, for a bit, and I liked seeing things I never thought I'd lay my own eyes on, in their natural setting. I'll tell you about the trip and the bits and bobs of all of the adventures in the next few weeks or so, as I remember them and go through my notes and so on and so forth. The cheese factory, the almonds, the ridiculously good pizza. Today though, today, I'm going to tell you what I learned while on my grand adventure, and not a whole heck of a lot of it has to do with food. I am neither as brave nor as badass as I actually thought I was, and actually missed my family tremendously, including the two teenagers. Americans on holiday with unlimited quantities of wine sometimes do not behave in a way that is appealing. You should have at least a passable understanding of the language before you visit a foreign country. It's just the respectful thing to do. Hearing an Italian say the word Viper instead as Veeper will cause endless hours of laughter, and perhaps a nickname or two. You cannot seek out epiphanies. They must arrive on their own schedule, and sometimes not at all. Sitting in the basement of an Italian palazzo, cooking while music plays and a slightly off-kilter German stokes the fire of the pizza oven can be very pleasant indeed. If you're on a tour with a group of 20, you're incredibly lucky when you get a really good batch, even with the over-imbibing. A detox meal on the 8th day of a food-centric Italian vacation is never a good idea. It may be a fault to some, but I really don't care for Italian red wine, though Limoncello is all together another matter. If an Italian butcher and his family ask if you want you pasta "just a little spicy", the answer, must absolutely be a resounding NO. That's our chef, Dino, behind me. I got a "brava" for my mad gnochetti kneading skills. I liked Italy and I'd like to go back someday. I really liked the idea of Copenhagen a great deal more than I thought, though I never even got out of the airport or the hotel adjoining it. It could have been the great design or the tall blondness of everything, but it felt like a place I'd want to see...someday. So here's the group, with our hostess Christina, on our last evening at the Palazzo. We cooked, we ate, we had fun together. I met people I wouldn't have otherwise, from Vancouver and Alexandria, and from a few places in between. I was awed by the bravery of 3 young women, each traveling alone, and sometimes cursed the ability to go online and check emails and post pictures and recount the day to those at home instead of finishing it out by being downstairs, swilling down bio-dynamic Montepulciano in great quantities. I relished each lunch and dinner and cursed each breakfast, sucking down cappuccinos and not much else. I was terrified on the mountains and became "that woman", much to my chagrin, and tried to play off the fear, though unsuccessfully. I learned a few things in the kitchen, though not as many as I hoped, and though I was happy to set foot again on American soil, it was really for the family at home and not necessarily just being in the good 'ole U. S. of A. So now it's back to real life, and summer camp registrations and staffing and business and softball, and track and...you get the idea. It was a week ago from this very moment that we were filled to capacity with fish & emotions. I'm glad I did it, and I'm glad to be home. i just moved back to the states in July from Italy. We lived in Sicily for three years. We had some amazing experiences and the best ones included amazing food :) I had the privilege of attending many cooking classes, some at a cooking school in Sicily. So glad you got to experience la dolce vita! Me too Joy! 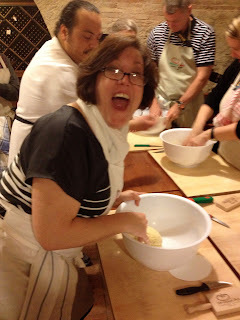 I enjoyed the trip tremendously, and I'd like to go to another region in Italy some day to really cook. Any country that has Parmesan and salami at the rest stops is good with me! I just moved back to The States after 7 years in Tuscany. I MISS the extraordinary pizza and the simplicity of the Italian kitchen. I miss going to the market and marveling at the beautiful fresh local produce. Back in the USA I do everything I can to keep my Italian experiences fresh in the kitchen and in my heart. There is nothing like "la cucina italiana". Love your honesty and fresh eyes Christine. Europe will always me my first love... okay well maybe I love Montana more??!! So wonderful to hear your insights and think about your lovely trip. Thank you for sharing it with us all. Your story brings back memories of our family trip to Spain nearly 12 years ago. Staying with family I was welcomed into many kitchens and fed many traditional dishes. And oh the cheese, the hamon, and the gazpacho will stay with me forever!